A rigorous documentation of 24 hours of neck-beard growth, highlighting both the coarseness and density of neck-beard hairs. I am what most people would consider a “well-bearded” individual. According to this graph, I fall rather appropriately into the category of “Sea Captain”. Despite my proud embeardedness, I also play host to a horrifying parasite frequently referred to as a “neck beard”–a foul nest of bristles with a coarseness and consistency that lies somewhere between steel wool and dermal denticles. This means that, appearances aside, I still need to shave, sometimes twice, daily. If you’re like most American men, this means using either disposable razors or cartridge razors, both of which result in discarded plastic and steel. Cartridge razors, commonly found with an increasingly horrifying numbers of blades, vibrators, laser pointers, and PEZ dispensers, produce less waste but are also more expensive. The average price for the three-bladed monster at my local pharmacy runs about $4.00 a cartridge, and those things don’t last very long–I’m lucky if I can get 2 weeks out of a single cartridge, often less (although, somehow, the very last cartridge in each pack seems to last 3 times longer than the others). In addition to wasting plastic and steel in the actual cartridges, and plastic and cardboard in the packaging, I’m burning around $100 per year. There are a few possible ways to reduce shaving associated waste. The most obvious is switching to an electric razor–which is what our other beardly blogger did until recently (he now reports that “My beard used to destroy electrics in less than a year.“)–but the cutting heads need to be replaced and they will, eventually wear out. I’m also not a fan of electric razors, I don’t particularly like the shave I get with them. Next on the list are single-blade safety razors, the classic standard of the 1930’s through 80’s. These have the advantage of no plastic, and allegedly get you a closer, cleaner shave than disposables (though I suspect that has more to do with the brush/lather and spending more time on getting a good shave), but the blades are still disposable. So, it appears as though, if I truly want to eliminate as much waste as possible from my shaving routine, I need to take a more traditional approach. 1. Target Behavior – shaving with disposable razors. 2. Problems Associated with Target Behavior – plastic, steel, cardboard waste associated with disposable cartridges and packaging. 3. 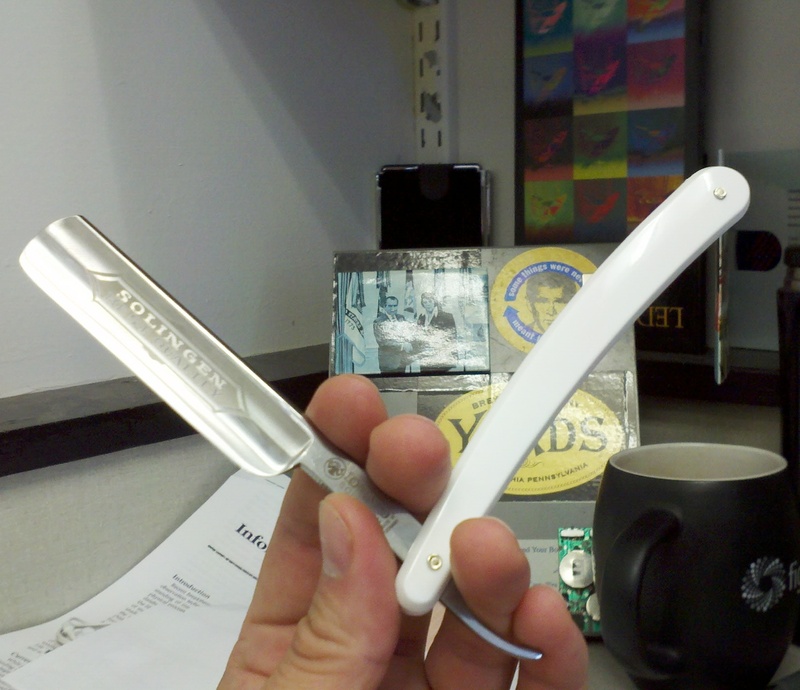 My Personal Solution – switching to old-school straight (“cutthroat”) razor. In the grand scheme of things, the amount of waste that I’m removing from my life is trivial, and while I’m very close to zero shaving-related waste, there is some associated with the packaging of various necessary products. Relative to the amount of waste produced with cartridge razors, the two bars of shaving soap are fairly minor and could be found plastic-free at various farmers markets. The financial incentives are far more substantial than the waste reduction. Once purchased, a good straight razor should last a lifetime. There’s obviously a learning curve associated with the process, but an hour browsing YouTube and a few weeks of practice was all I needed to get up to speed and not cut my throat open. The point of the personal sustainability challenge is not about saving the world – see my introductory post where I discuss that “personal sustainability is a philosophy, not a solution for global problems“. This is about establishing and fostering a personal sustainability ethic by identifying sources of waste in my life and reducing them as much as possible. There are three reasons that I started with this project. First, shaving is an obvious, though often overlooked, source of waste that is easy to reduce if you decide that it is a problem. There are plenty of options available for replacing disposable razors, all of which will save you money in the long run. Second, the solutions already exist. There are no technological hurdles to overcome, no extreme, lifestyle-altering commitments to make, just a simple change in my morning routine. The solutions (either straight razor or safety razor) are generally better. We figured out how to get great, close, smooth shaves more than a century ago. It takes a little longer and requires a bit of practice and concentration, but there’s no doubt that the shave I get with a straight razor feels better than any shave I’ve had with a MachXSuperBladeRunnerVibratoTurdo. Using disposable razors is a habit of convenience that is easy and rewarding to break. Finally, there is something to be said for starting every morning feeling like you just sauntered out of the OK Corral. What’s your preferred means of keeping the non-neck portions trimmed, thus avoiding ZZ Top-itude? I am also have the sea-captain beard and tough follicles. Also like you I tire of the wastefulness of disposable razors, so I may follow your example. Now, how about the other half of this energy/trash equation: are you using canned, pressurized pre-made stuff in an endless series of steel cans with plastic valves or really rocking it old-school with a brush and soap? Two pucks of Williams glycerin stuff per year sets me back about two bucks, and come in cardboard, not steel. I’ll see your straight razor and raise you one tuft of boar’s hair! Boars hair? Boars hair?! The finest brushes are plucked exclusively from the hind-neck of a mature she-badger. But yes, a brush and proper soap is a prerequisite to a good shave. You should actually master the proper lather before you upgrade to the straight edge.